had curious places of capture. This is one of those curious places. I'm asking. Appreciate any feedback. this is the way I found it. 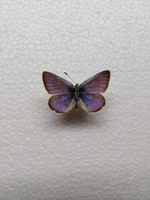 Xerces Blue - now extinct... but once common in the fog-zone along the beach in San Francisco. Here are some I owned a few years ago. I agree - G. xerces, a rather dark underside example. Why don't I ever run across material like that for sale??? Wow! That's a nice surprise to hear... Thank you very much jshuey and jhyatt for this species determination. So now that I have an undiscovered gem amongst my collection I have decided that it might be happier in a new home where another collector would appreciate it more than me. 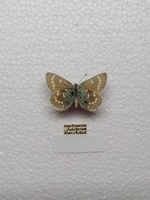 Therefore, any members interested in owning a genuine "extinct " species of butterfly need not look any further. It is in pretty good shape overall but, not infallible as you can see. However, how many opportunities come up to own something so infrequently offered? So, here is my proposal. I do not want any cash offers (for now). I would rather exchange/ trade specimens for this one. At heart, butterflies are my first love. Therefore I am looking for a butterfly trade. For further details please PM me. I do not want papered stock.... Trade material is to be mounted and "collector grade" condition.